​Eastside Queer Stories is an LGBTQ one-act play festival, featuring 6 plays written by LGBTQ playwrights. Below is casting break down of each play and the characters. 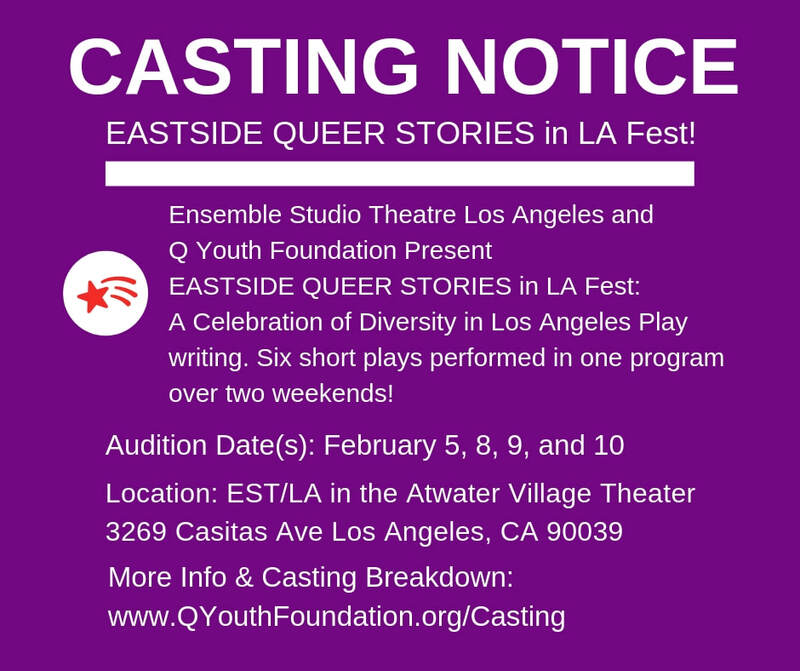 Lizzy Ross, Abe Zapata Jr.
​​Eastside Queer Stories is an LGBTQ one-act play festival, featuring 6 plays written by LGBTQ playwrights. Below is casting break down of each play and the characters. turns to her pre-colonial ancestors for guidance. Mina’s ancestors and represents Mina’s ancient ancestral history. Latino/Brown, male. Rosa’s husband, Mina’s father. Tries to keep Rosa from worrying over her dreams. Any race/ethnicity except Latinx/Brown. Mina’s rope play partner, a rope top/rigger. their own young lives on the penultimate evening before they all move out of their apartment. ago. Playful/creative with gender presentation day by day, and integrates it into their art. Spoken word. Vocals. Some Spanish and Nahuatl. anarchy philosophy academic and punk, works at a grassroots non-profit. Light Spanglish. considered. A stand-up comedian and side hustler. Quick-witted, direct attitude, smooth confidence. a secret of his own. shop, is sexually liberated and has always put Beto in front of her own personal needs. revelation of how his father actually died. day as the truth about his death surfaces and Beto’s diagnosis comes to light. own way in the world. Female, she/her, any ethnicity. Part of the resistance against the system and Rei’s neighborhood friend. Male, he/him, any ethnicity. System work trying to get individuals to assign themselves. Male/ he/him, any ethnicity. Workers within the system The boundaries for the civilians. affected by her inability to take accountability for herself. her flaws in a more loving, constructive way. from her mother and girlfriend -- until she learns about the illness her mother hid from her. person with an independent reasoning in life. A bit greedy but still cares for people.